Ireland's developing wind industry has enormous potential and could become an important export for the country. As one of the windiest countries in Europe, Ireland has a massive resource waiting to be used. The Irish Government has recently indicated that it is ready to kick-start a new industry, partly in response to the fast approaching Kyoto penalties but also in response to EU initiatives on Carbon taxes and CO2 reduction. A major justification of this strategy is to reduce Irish dependence on imported fuels for the purpose of supply security. Without development of renewables, particularly wind, it is expected that the proportion of native fuels used to generate electricity will drop from 43% in 1994 to 8% by the year 2011, primarily due to the depletion of native natural gas, the depletion of the Irish peat resource and the general increase in electricity demand. It is expected that wind energy will play a proportionally larger role in the energy mix of Ireland than in other EU countries, owing to the low electricity demand relative to the wind resource. The industry, although still in its infancy in Ireland, is at a crucial point in its development. Ireland is seriously lagging behind the rest of Europe with regard to wind generation despite having the best wind resource. Wind currently accounts for less than 2% of the total electricity currently entering the Irish grid. In parts of Germany 56% of the energy generation is from wind while the figure is over 20% in Denmark. Ireland and Denmark are alike in terms of population. Despite this, Ireland is only at Denmark’s 1988 levels of turbine capacity. Currently Ireland has 174MW installed while Denmark has almost 3,000MW installed – accounting for approximately 20% of the Scandinavian country’s electricity requirements. Eddie O’Connor, CEO of Airtricity, the largest renewable energy company in Ireland, has said that "the current situation in Ireland is unacceptable. Despite having the best conditions for wind generation in Europe, Ireland’s renewable energy production is at such low levels that it corresponds to only 1% of the German level, 3% of Spain and 6% of Denmark. Ireland should be harnessing its natural resources and should be a net exporter of power rather than an importer". Why is wind power good for the Irish economy? Ireland is overly dependent on fossil fuels. Currently, Ireland is 57% dependent on gas and oil-fired generation, and this is 2.4 times the European average. Bringing wind into the generation mix will reduce Ireland’s electricity price exposure to external energy price shocks. Wind power ensures that money spent on electricity is kept in Ireland. It creates wind industry related jobs in wind turbine manufacturing and research. Farmers who own the land on which windfarms are built received increased income whilst still being able to use 95% of their land for traditional farming. compared to 6.8 p/kWh Germany. Ireland could presently generate 25% of its electricity from the wind with no increase in electricity prices to the consumer. Ireland could become a net exporter of power, rather than a dependant importer. Ireland's Wind Industry would contribute significantly challenging international Kyoto target to limit increases 2008-12. Under the terms of the 1997 Kyoto Protocol, the agreed target for the EU was to reduce its 1990 levels of greenhouse gas emissions by 8% in the period 2008-2012. Under the same agreement, Ireland was allowed to increase its emissions by 12% above its 1990 levels. Currently, Ireland is over 30% above 1990 levels. If Ireland fails to meet its target, large fines will be imposed. Allowing for the fact that some initiatives have been introduced, estimates indicate that these fines will be in the range of €1.3 billion to €4 billion in 2012, unless a much more comprehensive policy approach is adopted. Fines of this level would equate to about 2.8% of Ireland's GDP. Moreover, these fines are not once off but could be applied annually for each year that Ireland exceeded its target limits. The Kingsmountain Wind Farm at Kingsmountain, County Sligo, consists of 10 wind turbines that produce enough energy to power approx. 20,000 homes. The Kingsmountain facility can deliver 80GW in one year – enough electricity to save the release of 65,000 tones of CO2 into the envoronment every year. That is the equivalent of taking 15,000 cars off the road. Kingsmountain is operated by Airtricity, Ireland's largest renewable energy company, which is currently constructing the Meentycat Wind Farm, north of Ballybofey in County Donegal. Meentycat is expected to be completed in early 2005 and will be the largest wind farm in Ireland. The Meentycat facility consists of five individual projects in the area with a total of 38 turbines. It will produce 72 MW of energy and will help stabilise the voltage in Donegal by providing electricity where it is badly needed. The Codling Offshore Wind Park will be situated off the east coast of Ireland, between Greystones and Wicklow. Phase 1 of the development will total 220 x 3MW wind turbines (660MW), producing in the region of 2.1TWh/annum (which is equivalent to over 11.1% of Ireland's energy consumption in 1999). The development of phase 2 has the potential to double this output to 5TWh/annum, which again is equivalent to over 27% of Ireland's energy consumption. The output of the Wind Park would be sufficient to power a minimum of 395,000 average households with clean electricity. This number could reach upwards of 790,000 households for larger turbines. The development of the whole site could represent a reduction in CO2 emissions of just over 1.7 million tonnes per annum, which is equivalent to approximately 12% of the total CO2 emissions from all of the Republic of Ireland's generating stations in 1998. In the early eighties the Danish wind turbines rapidly became large enough to produce more than what the single household or farmer would use themselves. This resulted in two principal types of private ownership: a) several people jointly erecting a wind turbine on a reasonable site nearby and b) the landowner erecting his/her own wind turbine and selling the excess production to the grid. Some 150,000 Danes have already invested in wind power and own wind turbines or shares in wind turbine co-operatives. Denmark has about 5,500 wind turbines, out of which 75% are privately owned by local co-operatives. Most of the employment created by the Danish wind industry is primarily situated in sparsely populated areas of the country, contributing importantly to the welfare of some rural economies. This is a relatively simple programme to administer. It is justified on a broad social basis, i.e. it is good for the environment (helping to meet government pollution abatement commitments) and it helps preserve the rural community. It also has helped build a large new industry in Denmark (thousands of jobs) and avoided the import of fossil fuels. Denmark plans on producing half of its electricity from the wind by 2030. Ireland has a much bigger wind resource than Denmark. Ireland has the capability to do what Denmark has done. Wind turbines kill lots of birds - The available evidence suggests that appropriately positioned wind farms do not pose a significant hazard for birds. For example, The 9 harbour-wall turbines at Blyth, Northumberland, are in a busy bird area. Of the bird flights through the wind farm, only 1 in 10,000 have resulted in a collision. This translates to 1-2 collisions per year per turbine. To put the issue into perspective, every year more than 10 million birds are killed by cars in the UK. Wind turbines are noisy - Modern turbines are actually very quiet! 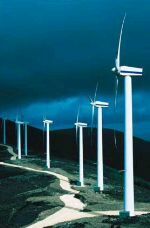 Thanks to advances in wind turbine technology, well designed, well sited turbines can be quiet enough to cause no disturbance to people living just a few hundred metres away. Tourists hate wind farms - There is no evidence to suggest that wind farms deter tourists, indeed many wind farms are themselves tourist attractions. For example, Cornwall's first commercial wind farm received 350,000 visitors in its first 8 years of operation. An energy centre was opened at the site in 2001 and received 50,000 visitors in its first year. In Scotland, a Mori poll was undertaken in 2002 regarding wind farms in the Argyll area. 80% of tourists said they would be interested in visiting a wind farm if it were open to the public with a visitor centre. In Denmark, many tour agencies run boat trips to take visitors to see the offshore wind farm at Middelgrunden, near Copenhagen. Wind turbines spoil the landscape - This is a highly subjective issue. While some people express concern about the effect wind turbines have on the beauty of our landscape, others see them as symbols of a better, less polluted future. In comparison to other energy developments like nuclear, coal power stations, or open cast mining, wind farms have relatively little visual impact. If we don't switch to cleaner forms of energy, climate change will severely and irrevocably alter much of our landscape as well as the animal and plant life it contains. Do you want to know more about Wind Energy in Ireland? The IWEA promotes the use of wind energy in Ireland. Its members are business people, environmentalists, academics and land owners who recognise that wind energy will soon become one of Ireland’s most significant sources of energy. Sustainable Energy Ireland is Ireland’s national energy authority. The Authority promotes and assists environmentally and economically sustainable production, supply and use of energy, in support of Government policy, across all sectors of the economy. The world’s largest renewable energy association, EWEA promotes wind power at the European and international level.